2015 was a terrible year for oil and it looked like 2106 would even worse; oil dipped below $30.00 and all cockroaches (oops we mean analysts) started to state $10.00 oil was next. When we heard this nonsense, we penned an article titled will the crude oil price crash become even worse in 2016? What you need to remember is that the oil market tanked suddenly, and this occurred while the Top Analysts were making calls for higher prices. Hence, just as the oil market collapsed when everybody was proclaiming higher prices, oil will probably stabilise sometime in 2016 as everyone expects it to keep crashing. 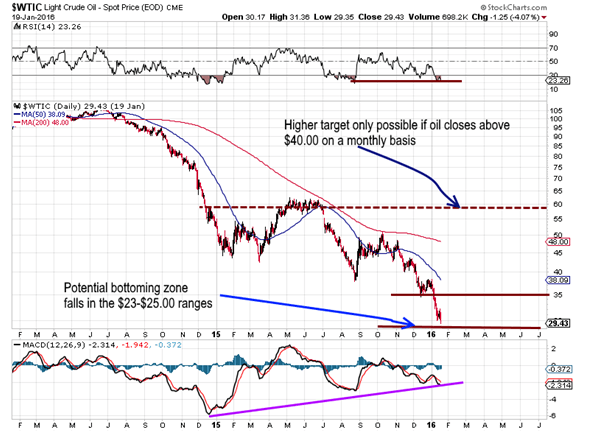 Notice that the $30.00 price point level has held on a monthly basis. Oil has not closed below this important level on a monthly basis for two months in a row, and this has to be viewed a very bullish development. 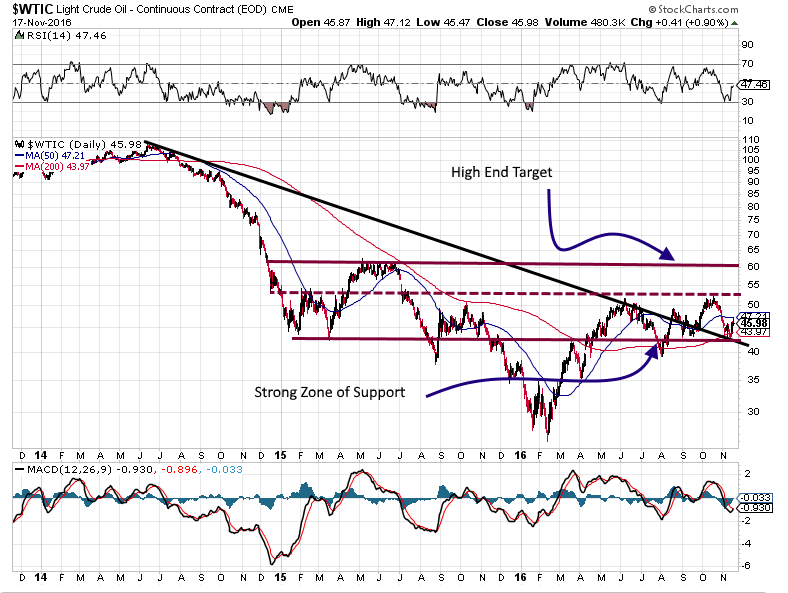 Our overall view is for crude oil to trend higher with the possibility of trading past the $55.00 ranges. In the face of extreme negativity, oil is reversing, just as it collapsed in the face of Euphoria. A weekly close above 35.00 will set the foundation for oil to trade past the main downtrend line and in doing so send the first signal for a move to the $50 plus ranges. So what does the future hold in store for oil? Oil traded as high as $51.34 so we did not fare too shabbily regarding our suggested targets for oil. Before we continue, it appears less and less likely that oil will trade past $90.00 unless the investment bankers and oil companies collude to boost oil prices artificially. Every few months’ large fields of oil are being discovered; the latest find is in Texas. One portion of the giant field, known as the Wolfcamp formation, was found to hold 20 billion barrels of oil trapped in four layers of shale beneath West Texas. That is almost three times larger than North Dakota’s Bakken play. The chart below was the chart was used in the Jan 2016 article which we referred to at the start of this article. $65.00 represents the high-end target or extreme targets. If you look at the chart, you notice that crude oil traded to almost $52.00 before pulling back, so it came within striking of hitting the targets we issued in Jan of 2016. Oil is holding up remarkably well in the face of strong a dollar; in fact, it started to trend higher as the dollar strengthened. If the dollar should let out a bit of steam, then Oil could quickly surge to the $55.00-60.00 targets before pulling back. Given that oil was trading below $30.00 when we penned the article in Jan 2106 we are quite satisfied with the way oil followed the projected pathway. As we are now towards the end of the bullish phase caution is warranted; traders looking to play this final move should consider opening positions below $45.00 and once oil trades past 51.50, consider placing tight stops. After oil trades to the suggested targets, we expect oil to pull back to the $45.00 ranges with a possible overshoot to the $39.00-$42.00 ranges. A person’s fate is their own temper.